Possibly the biggest party you will ever throw, so lets make it look fabulous! I offer both a bespoke service or ranges below. Please contact me here with more details and quantities and I can give you a quote. Fresh, contemporary and tropical. A range of natural illustrated botanical stationery. The fern leaf is hand painted with watercolours and is printed in colour on a thick white card. The names are written in a calligraphy brush lettering style. The set is supplied with kraft envelopes to complete the natural look. Invitation, party information booklet, RSVP card & place names. Spread the news about your big day with playful ticket styled rustic wedding invitations. 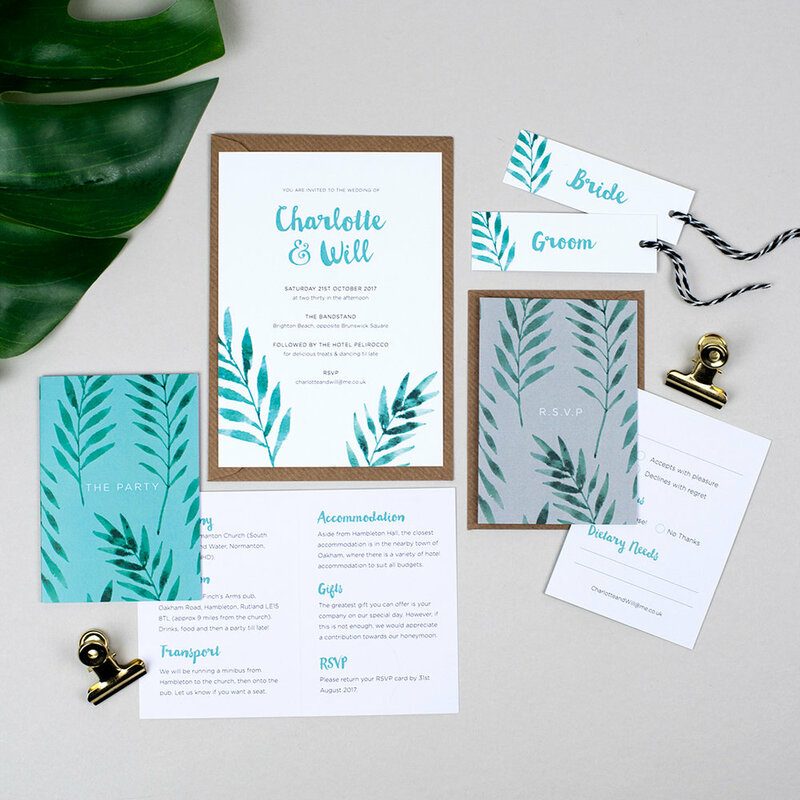 The woodland wedding stationery looks natural and is printed in colour on kraft card. It is single sided and looks just like a ticket for the big event, garden party or festival wedding! Celebrate your wedding or party with these flamboyant flamingo wedding invitations! They contain fun retro style typography with an exotic beach party feel and have an illustration of two flamingo birds making a heart shape on a turquoise background. All designs can be adapted to fit your colour palette and requirements. When you have placed an order you will receive a digital proof. Once you have carefully checked and approved the design and text I will send the artwork to print. If I need to make any amends we can do so and follow up with another proof for you to accept. Please supply your text in a digital format.